At the begining of October, [IRS] auctions hosted the liquidation of the Moosehead Furniture manufacturing plant in Dover-Foxcroft, Maine. 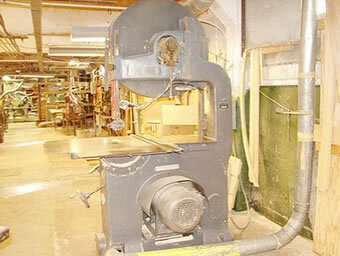 Moosehead was a family owned business that had been in Dover-Foxcroft since 1959. 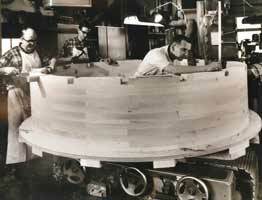 Moosehead had a second manufacturing facility in Monson, Maine that wasn’t part of the liquidation. Early this year, the owners announced that they would be closing the business down. They cited competition from inexpensive foreign imports as the primary reason. The company wasn’t anywhere near bankrupt, but the outlook wasn’t good. The owners decided it would be better to shutter the two facilities and liquidate the assets before they got into financial trouble. 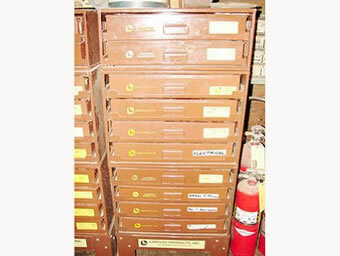 The assets were offered for sale while the plants were still in operation. A local buyer agreed to buy the name and all of the assets in the Monson plant. The owners were now left with the Dover-Foxcroft plant to liquidate. As a result of the sale, sixty jobs were lost in Dover, and another sixty were lost in Monson. That left only forty of the Monson employees on the payroll. The plant Dover plant operated in a building that had once been a woolen mill. 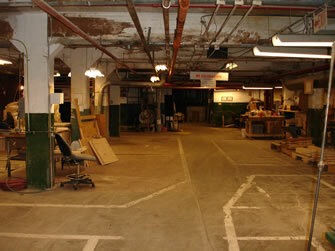 The building consisted of three floors and a basement. 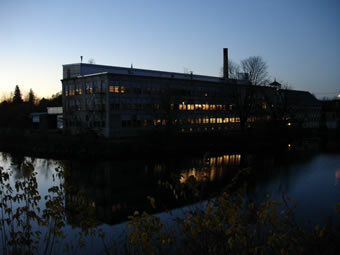 The plant is in the center of town, with the river wrapping around the building on two sides. 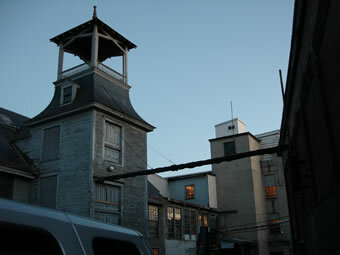 The building is separated from it’s closest neighbor by a narrow alley-way. The location and the structure made access and machinery removal quite difficult. I purchased just a few items in the sale. 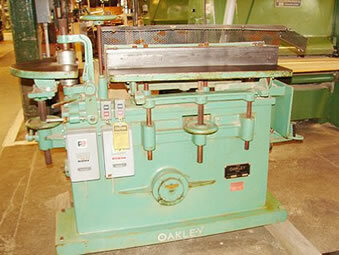 The first was an Oakley H-6 edge sander. The sander was in excellent condition, but was missing the motor and drum. The second item was listed as a “busting” saw. 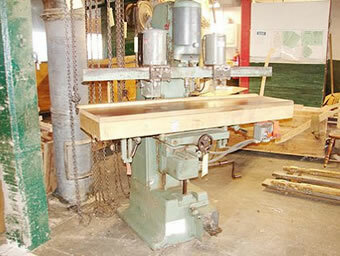 It consisted of a heavy steel fram with a butcher block table. Mounted under the table is a 5 HP saw arbor motor. It also included a nice three wheel feeder. One of the guys in the plant told me that this saw had been used to cut badly cupped lumber before it went into the double sided planer. 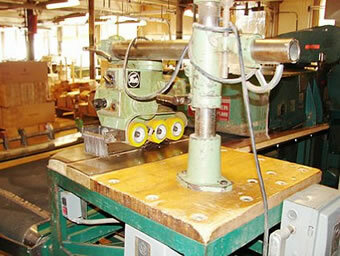 He said this greatly reduced the number of jams in the planer. 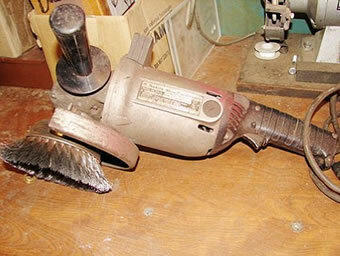 Finally, I picked up a bunch of small hand tools and a 8″ angle grinder. I was also tasked with picking up some items for a few friends. This included a small scraping machine, a few cabinets of hardware, a Wysong mortiser, and a Yates American Y-36 Bandsaw. 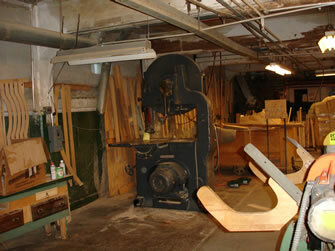 All of these items were on the first floor, except the Yates Bandsaw which was located in the basement. The overhead clearance in the basement was 6″ less than what was needed to get the saw out standing up. This meant the saw would need to be layed over on it’s back. The first thing I had to do was to spin the saw around so it was facing backward and pushed as close to the wall as I could get it. I had to do this with a shale bar, moving it a few inches at a time. 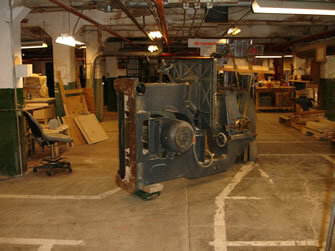 This saw weighs somewhere around 4,000 Lbs, and there is no place to get a bar under the main casting. I had the use of a small clipper forklift, but it was only rated for 1/2 ton and… it was on it’s last legs. The next step was to tip the saw forward enough to get a rubber pad under the back edge of the base casting. This is needed to keep the saw from sliding while it’s being tilted back. Once the pad was in place, I hooked a come-along to the column and started tipping the saw backward. At first, the forklift tried to roll forward, so I blocked the wheels. Then, the forklift tried to tip in towards the saw. I was able to use a bar and a block of wood to tip the saw enough that I could move it with the come-along. I did this until the saw was tipped far enough that it could easily be pushed over backward. I then blocked the saw up and moved the forks so they were directly over the support casting for the upper wheel. I used a chainfall to tighten the straps, and then gently tipped the saw back by hand. Once the saw was leaning back, I let the slack off of the chainfall and lowered the saw to the floor. Once the saw was on the floor, I moved the straps to the outer arm of the upper wheel support. I lifted the saw up high enough to get a pivot block under the back of the column. When I lowered the saw back to the floor, this lifted the base casting high enough to get a block with two machinery skates under the base casting. Once the skates were in place, I was able to carefully pull the saw out into the center of the floor. As can be seen from the pictures above, this is a bit scary. I was doing all of this alone, and the saw really wanted to tip everytime I pulled on it. Once in the center of the floor, I placed additional skates under the upper column and moved the lift to the top of the base casting. The Y-36 has a slit in the front base casting just above the foot that is large enough to get a 3″ strap through. I pushed a strap through the slit and wrapped it around a wooden block. I was able to get the strap around the forks and push the saw to the elevator. It was a little hairy because the saw weighed twice what the forklift did, but in the end it worked pretty well. The elevator presented a number of other problems. 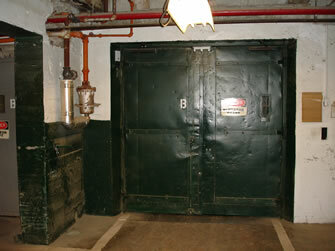 First, there was a wide gap between the floor and the elevator deck. This meant that the machine skates were not going to work. 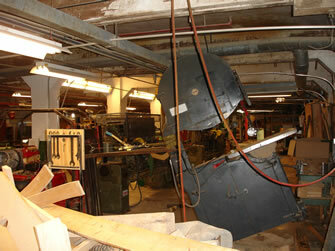 Second, the elevator was not large enough to accomodate the saw and the forklift together. This meant that I had to push the saw into the elevator, and then drag it out on the first floor without the aid of the forklift. Fortunately, the push into the elevator went smoothly. As luck would have it, there was also a large support column just outside the elevator on the first floor. I was able to use this column to pull the saw out of the elevator. Once I was clear of the elevator, I used a chain attached to a post on the loading dock to pull the saw next to the dock. At that point, I was able to use a forklift that was outside the building to pick the saw up and set it on the ground outside. Next, I stood the saw up and loaded it on my trailer. This entire process took most of the day. From there I moved on to loading the items on the first floor. Everything went smoothly until I came to the Wysong mortiser. 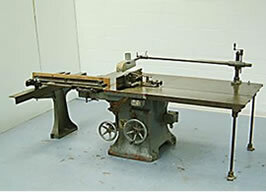 This machine had been modified by adding two drill heads, and a large table. This made the machine very top heavy. I almost tipped it over just using a bar to get a block under the base. I decided that it was better to push it to the door. Once there, I wrapped a strap around the upper column and lifted it with a forklift on the ground. This little adventure started at 6:30 AM. By the time I was loaded and secured it was 6:00 PM. In before dawn, out after dusk. It wasn’t easy, but there were no injuries requiring medical attention, and at list there was a feeling of acomplishment for a hard day’s work (this is something that’s hard to come by at my day job). You know how to have all the fun!